Geometric civilization of little Trapezoids had fought countless times against evil Triangles. Now they face their own extinction as Triangles finally decided to go "Nuclear" and finish them once and for all. 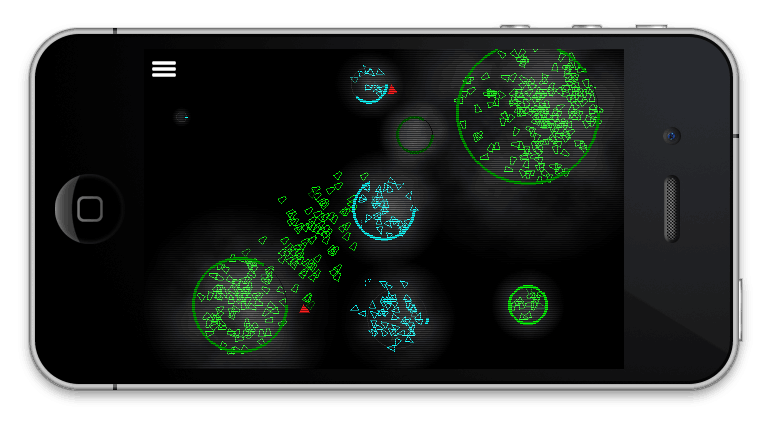 Nuclear Crisis is realtime strategy game. You can control several nations of trapezoids and your only mission is to survive each level by destroying all nations of evil triangles. launch a nuclear bomb to specific enemy target: you can launch a bomb if you have your bomb indicator (ring around the nation) fully recharged. split your nation in two halves: you can split a nation only if it has population above some level (around 50). Nation is blinking. merge two nations into one: you can do it anytime but you will lose all progress of bomb creation in merged nation. To perform an action just make a drag gesture from one of your nation to the desired target (for launch a nuke or merge) or to the desired position (for split). Full source codes (xcode project) are included. You will need your own provisioning profile to run the game on the device.